Around 75 years ago, in February 1942, US President Franklin Delano Roosevelt signed Executive Order 9066, which led to the forced relocation and internment of more than 110,000 individuals of Japanese ancestry. The majority of them were American citizens, and a large proportion were children. 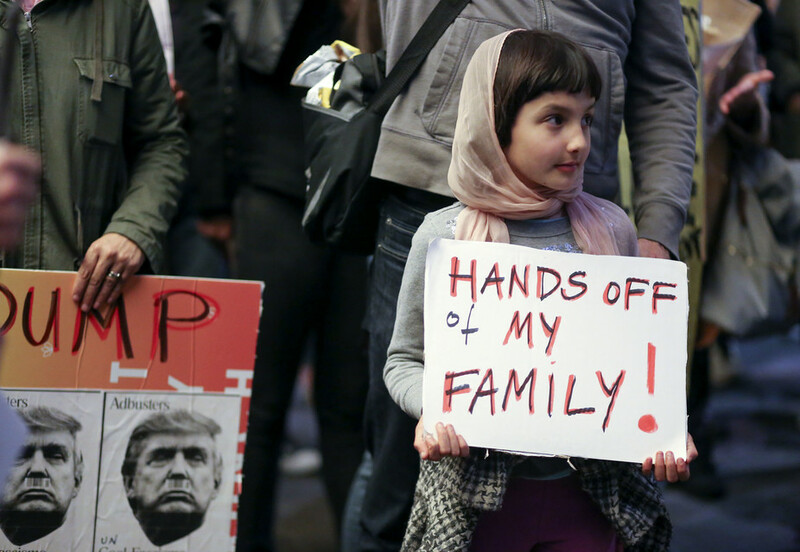 But unlike President Trump’s 2017 executive order to halt immigration and ban refugees from American soil, Roosevelt’s sweeping political move did not provoke any protest or dissent. Both presidents had mentioned the notion of “national security’ in their orders, and both decrees were said to be aimed at specific national groups. So is President Trump merely copying the policy of one of his more popular predecessors? From the moment the US entered World War II in late 1941, all “enemy aliens” living in America – German, Austrian, Italian, and Japanese – were subject to restrictions on their freedom. These included the imposition of curfews and a ban on owning radios. So the real significance of EO9066, as it is known, was that it authorised the detention not just of enemy aliens, but also of American citizens. In theory, any American citizen could be relocated by order of the military. But EO9066 was created for a particular purpose, which was to enable the internment of Japanese Americans living on the West Coast of America. It also made it possible for further orders to be authorised, such as Civilian Exclusion Order No.79, which ordered that “all persons of Japanese ancestry, both alien and non-alien” be excluded from a portion of the West Coast. 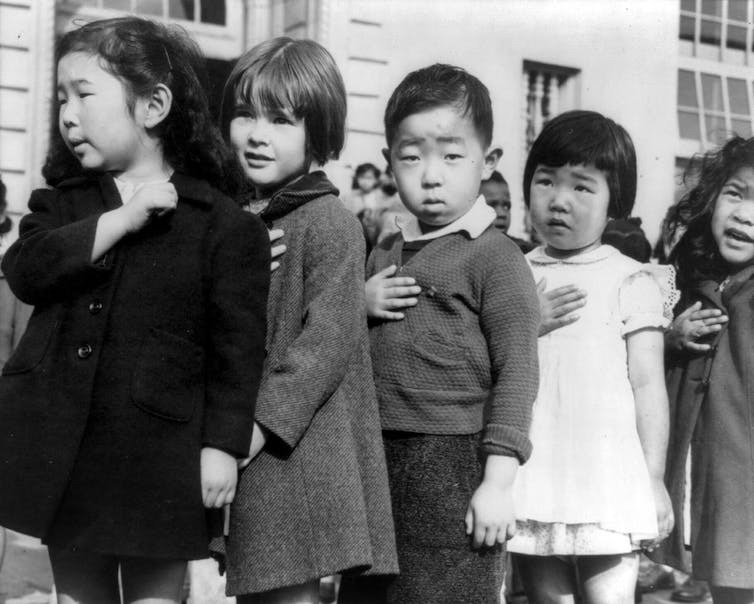 Japanese American children pledging allegiance in California, 1942. Yet one of the most striking things about EO9066 is that, unlike Trump’s executive order, it does not once talk about nationality. Instead, Roosevelt gave military commanders the right to “prescribe military areas in such places and of such extent as he or the appropriate military commander may determine, from which any or all persons may be excluded”. 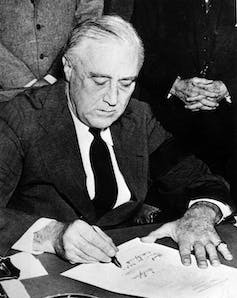 Roosevelt declares war against Japan. The creation of protected military areas during times of war is not unusual, and makes sense for security reasons. However, usually these zones surround military installations and coastal areas where the threat of invasion is greatest. In the case of the US during World War II, the whole of the West Coast was designated a military protected area. The most likely place for invasion, however, was the only place on American soil that had already been attacked – Hawaii. About 40% of the population of Hawaii was of Japanese descent, as opposed to the West Coast, where they made up just over 1%. The military knew that Hawaii could not function if all the Japanese people were removed, and therefore decided to impose martial law. Individuals (usually men) considered the greatest threat to national security were arrested and interned, while the rest of their families were able to live at liberty. Currently, any immigrant or refugee who is given entry to the US goes through a stringent vetting procedure. This is partly why, according to American think tank the Cato Institute, no refugees have been involved in terrorist attacks on US soil since the Refugee Act of 1980. It is also worth noting that those behind major terrorist attacks in the US have mostly been born in America, or were permanent legal residents from countries not covered by Trump’s ban. But perhaps the greatest similarity between Roosevelt’s and Trump’s orders is how American-born children are affected. Half of those interned under EO966 during World War II were American-born minors. Some have said this was inevitable because of the decision to intern both Japanese parents in the continental US. However, not all German, Austrian, or Italian mothers were interned, which meant that not all of their children were taken to camps. In some cases, German-American children were left without care when both their father and mother were arrested. In other cases, families could “voluntarily” request to join husbands and fathers interned. There was no choice for Japanese-Americans. In other allied countries such as Great Britain, most enemy alien women were allowed to remain at liberty, along with their children. In the US, the children were considered as much of a threat as their foreign born parents, leading to the internment of entire family units. This seems to still be the case today, as demonstrated by the fact that an American five-year-old boy was detained for more than four hours as a result of Trump’s immigration order because his mother was Iranian. Sean Spicer, Trump’s press secretary, defended the decision because “to assume that just because of someone’s age and gender that they don’t pose a threat would be misguided and wrong”. American-born children, therefore, are still considered dangerous, but only, it seems, if they are born to non-white immigrant parents. For others born in the US their rights appear to remain linked to the country of their parents’ birth. Just as in 1942, the promise of “liberty and justice for all” still does not to apply to all American citizens.